Let's start at the beginning and take a look at the cover. It's pretty well-drawn, but seems extremely busy. The lightning bolt being shot by "The Eel" over on the left side just looks bad. It's not a terrible cover, but it's certainly not that great either. It loudly proclaims that this particular issue is for action lovers, but (as you'll see below) that isn't really true at all. THIS comic is for lovers of 1960's-style madcap comedy, the likes of which hasn't really been seen for quite a while. Read on! In the previous issue, the X-Men have been captured by Count Nefaria, who wanted to recruit them to his criminal "Maggia" organization (Marvel's hilariously obvious way of dodging code-violating references to the "Mafia"). But he quickly learns that he needs to improve his recruiting methods when the Merry Mutants tell him to sit and spin. Despite this minor setback, Nefaria decides to go ahead with his plan. . .to take Washington D.C. hostage for (insert best Doctor Evil voice imitation here) One Hundred MILLION dollars. To accomplish his. . .er. . .Nefarious. . .plan, Nefaria covers D.C. with a clear dome created by a 1960's super-science ex-machina device, and then, since the X-Men inconveniently decided not to help him, he sends his B-Team of minor Maggia supervillains disguised as the X-Men by way of hologram to deliver the ransom demand, giving the government 3 hours to pony up the cash or all the oxygen gets sucked from the dome. Of course, the obvious weak point in this plan is thinking the government can do ANYTHING in 3 hours. I can't even get my address changed at the DMV in less than 3 hours. But once again, I digress. . .
Back at Nefaria's base, the X-Men are trying to escape. Jean Gray tries and fails to contact Professor X, not realizing that he's busy working on a secret project and has pretty much decided to ignore all incoming mental calls. While the captured X-Men bungle around trying to figure out how to escape, Professor X is finally disturbed by a regular phone call. It's the military requesting he get his bald behind to Washington to consult on how best to destroy those evil X-Men holding the city hostage. . .which comes as a bit of a surprise to him. About that time, the X-Men finally free themselves and Professor X manages to get a "What the hell is going on, guys?" Mental call through to Jean Gray, and a plan of action is formed. AND WHILE THAT'S GOING ON. . .
Nefaria is contacted by the government and they've agreed to his terms. Even better, the X-Men show up and tell him they've changed their mind and will work with him. He sends the X-Men to pick up the ransom, then tells his fake Maggia X-Men minions (B-Listers Unicorn, Plant Man, Porcupine, Eel, and Scarecrow) to keep an eye on the X-Men for a double cross. The Maggia quickly decide to double cross Nefaria and steal the ransom for themselves. While all that is going on, Professor X arrives on the scene and sends his astral form into Nefaria's base to spy on him, learning the secrets of the ex-machina machine forming the dome over Washington, but unable to do anything because he's pretty much a mental ghost. The X-Men collect the ransom and are chased by both the military AND a mob out for the blood of those filthy, unpatriotic muties. They are rescued by the Maggia, but only so they can steal the ransom. A brawl ensues, complete with quips galore and expository power explanations shouted during battle in such a way that there can be NO doubt that this is a 1960's comic. In the end, the X-Men prevail, but Unicorn double crosses his Maggia partners, grabs the money and runs. 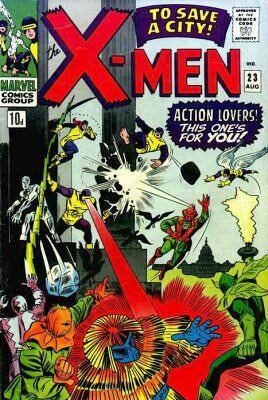 The X-Men give chase and get the money back, but the other Maggia villians regroup and there's a hilarious juggling back and forth of the bag with the ransom in it until Marvel Girl finally manages to escape the battle with it. Jean returns to Nefaria's hideout and gives him the ransom bag. However, their discussion about how great the Maggia is going to be with all this new money is interrupted by a mysterious masked man just strolling in and ignoring them while turning off Nefaria's machine forming the dome over D.C. The other X-Men finally arrive and are distracted long enough for Nefaria to escape with the ransom bag. The mysterious masked man is revealed to be Professor X walking around with the aid of his secret project. . .a transistor powered set of leg braces. Everyone takes a moment to say "Hold on. What?" before realizing Nefaria and the ransom is gone. On board Nefaria's escape boat, the criminal mastermind THINKS he's gotten away with the money, but Unicorn shows up for a final double cross, only for it to be revealed that the ransom bag is an illusion, created by Professor X using Nefaria's own illusion machine and they are taken into the custody of The Coast Guard. The real money is returned and the X-Men are cleared of wrongdoing. All's well that ends well, right? WRONG! After an extremely brief victory celebration. Jean Gray reads a letter she got in the mail and tearfully tells the X-Men she has to leave the team. Wait, What? Nope. . .to be continued. SPOILER FOR NEXT ISSUE: It's from her parents and they want to transfer her to another school. Okay. . .so that was the story. And there was a lot of it for one measly issue of a comic book. Overall, I really liked it. But not so much for the superhero action promised on the cover, but for the unintentional (or maybe not) comedy of it all. It reminded me a lot of those "madcap" or "screwball" comedies of the past, where everyone is running around and the situation just gets crazier and crazier. There are so many double crosses and inconvenient situations in this issue that I couldn't help but laugh as each new one popped up. By my count, there are 6 double crosses in this story, with "Criminal Mastermind" Nefaria being the victim of 3 of them! I'm not really sure that this book was meant as comedy, but there's just a zany feel to it that makes it really enjoyable to read. In particular, when the X-Men and the Maggia are fighting over the briefcase that has the ransom in it and it keeps getting passed from person to person. . .nobody can keep it for longer than a few moments before someone else grabs it. It's like something straight from an old Monkees episode! The art on this book was pretty good. Nothing really stood out in a big way, but there weren't any really bad parts either. It was just good workmanlike art, pretty standard for a 60's superhero comic. The coloring was pretty sloppy throughout the book, though. Not so much that it made for a bad read, but definitely noticeable enough to distract from time to time. All in all, I really enjoyed this issue. . .but probably not for the reason the creators originally intended. I found the multiple double crosses, inconvenient situations, ex-machina problem solutions, and cases of mistaken identity to be some good, funny reading. Like I said above, I'm not sure if the creators MEANT for this book to be funny in a madcap comedy way, but that's what I got out of it. I'd be interested in finding out if anyone else has the same take on this issue. Stay tuned for the next Retro Review that NOBODY ever asked for! As always. . .be there or be square.